Directions: coming over Red Hill from False Bay, steer left at the bottom (right to Scarborough). Shamballah is a bit further on and to your left. Coming from Simonstown around Cape Point, pass the Nature Reserve entrance on the left, then the Nursery on your right which is soon followed by Shaballah. Drawing on her extensive experience as an astrologer and secondary school teacher, Alex Trenoweth presents her ground-breaking research on the astrology of learning. By focusing on the Jupiter and Saturn cycles, she provides valuable insight and advice for anyone who wants to help the young people close to them captilise on their strengths at the crucial stages of development. Alex Trenoweth is a secondary schoolteacher who has discovered the secret to engaged and high achieving students is through capitalizing on her students’ Jupiter and Saturn cycles. 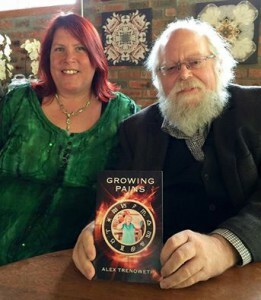 Her ground breaking research on astrology in education led to her book “Growing Pains” and was based on her studies for the MA in Cultural Astronomy and Astrology from Bath Spa University. Alex’s deepest wish is to bring astrology back to mainstream education and essentially rescue the baby from the bathwater. Alex is a dynamic speaker and has spoken at astrology conferences across the globe. In 2015, she was named “International Astrologer of the Year” by the Krishnamurti Institute of Astrology of Kolkata India. Special note: This will be our final gathering for the year – we hope to see you there!